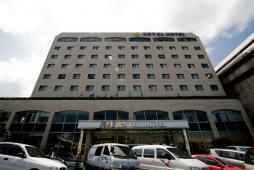 Jeju Royal Hotel is the 2-star hotel located in Shinjeju, which is the convenient area for shopping and traveling to major tourist attractions. The hotel is run only by the local interests. Transportation from Jeju International Airport is very convenient as it is only 5min by car. There are also many restaurants, shops and night spots around the hotel. There are 108 guestrooms with a selection of standard double, deluxe (twin, ondol, ondol bed), suite (twin, double) and royal suite. Spacious rooms are decorated with chic interiors and offer a comfortable stay. There is also a sauna to relieve tiredness from trip. Hotel offers a wide variety of facilities such as Korean, Japanese, Western restaurants, coffee shop, banquet halls and hair salon.